Great! Can’t wait to hold it in my Hands! Are the Swords(Numbers) sorted by the Date of its order or will the international Customers get a higher Number? The swords aren’t sorted no. We would have liked to find the first order, find the first sword, and send it out, rinse repeat, but it just wasn’t practical. We would have had to have all the swords delivered here, which means none would have been able to go out last month, which means everyone would still be waiting, then it’d be a lot of work. But everyone who ordered before is guaranteed a number under 1200ish, because the first shipment was the first 1200. Hey, just wanted to say I’m an avid fan of George’s books and a HUGE sword collector and couldn’t wait to get my hands on Longclaw. I gave his books, the upcoming HBO series and this site a shout out on my review site. 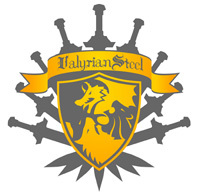 I also added this link (Valyrian Steel) to my site links to help promote these products. I’d be honored to have you guys check out my site, add a comment and or even sign up as a follower. Thanks again, and keep these great weapons a coming. I’d say that’s a bonafide “Lannister” guarantee. Thanks, that’s really great news! The first shipment WAS going to be 600. But the factory cranked out an additional 600 while waiting for freight booking so it became a 1200 shipment. That is not true Grant. The first orders were filled from the first 1200, randomly loaded into a container, randomly unloaded, and randomly shipped out. An international customer who placed an order has just as much chance as a domestic customer to get a number under 100. International orders are not being filled from a different container than domestic orders, it is the same randomly filled container. Got my e-mail today confirming imminent dispatch. Hopefully, I won’t have to wait longer than two weeks to get it. A shiny glimmer of good news to start off the worst month of the year: January! I was not aware that orders were being filled randomly. Although random shipping may address the issue of “Domestic Favoritism”, it does little to substantiate your initial assertion of order early; get lower number. A more literal and appropriate statement should have been simply, “The number of your sword will be completely random”. I realize for some (perhaps even most), this may seem like a minor nuisance. However, for an avid collector, this is a major bone of contention. Personally, I’d much rather wait and pay the premium for a specific sword (through “E-Bay” or similar venues) than order early and leave it to chance. Nonetheless, I am excited to receive “Longclaw” and do appreciate all the effort made by “Valyrian Steel” in creating such a splendid sword. For now, knowledge that “Winter is Coming” is sufficient to keep this pedantic collector as giddy as a teenage boy on prom night. The thing is grant, they number is not on the outside of the box, and they’re loaded in at the factory randomly. Thats just how it is. So to match up order numbers with edition numbers would involve a lot of work, and it would be something we could not leave to anyone else, meaning we wouldn’t have been able to have all the domestic orders shipped from the port, thus providing all those customers deliveries a couple weeks earlier than would have otherwise been possible. So yes, it is random within a shipment, but by being in the first shipment you assure you won’t get one higher than 1200, otherwise you could have gotten one as high as 2500. If we do really limited editions in the future of fancy real damascus longclaws with real garnet eyes, $1000 swords, limited edition of 100 pcs, we’ll assuredly spend the time to go through and make sure he who orders first, gets the first number. Valyrian, is there a chance of you guys doing this in the (near) future?? Are you sure that the number on the sword matchs the production order? Maybe swords are numbered randomly after production…making the number on the sword even more meaningless..
Maybe. If HBO goes through with the TV series it is almost assured. If not, probably not. On the otherhand, if we could get 100 people to put down a deposit in advance, we could do it. I think it goes without saying… I’d be interested in purchasing one of those “ultralimited superhighend ones”. Come on HBO!!! Returning in topic, has there been a problem or what? Have internetional orders been shipped? Valyrian, yes, that’s what I meant. Sorry I wasn’t clear enough, but it seems like you figured it out anyway. Oh, and yes, definitely I would be interested in the ultralimited ones too! Were the Swords sent away to Europe an the Rest of the World? I’m asking, because nothing has changed in my “Order History”. Could you (Valyrian) perhaps post here when they are sent? Yes, we’ll let everyone know, right now because of weather it looks like the shipment will not arrive here until Tuesday, so we plan to ship them out on Wednesday, but atleast we know it is on a truck and en route at this point. would my international order also ship out on wednesday if I ordered today by credit card or later? please give us an update on the international orders. Did they already ship out? Will you provide us with tracking numbers? I received my tracking number via e-mail from USPS on the same day that Valyrian announced it would be shipping soon (Jan the 4th). I presume this is for the sword as I have not ordered any other items from the US recently. As of 5 minutes ago the status is still listed as “Electronic Shipping Info Received” which means that they havn’t yet received the item for postage (it is only updated once each day and that isn’t until the evening US time), so I wouldn’t think the items have left quite yet. My bank account would hate me horribly, but I’d be interested in the ultra-limited super-heightened sword as well. Even if it means owning two copies of Longclaw. Just give me ample warning about it to save for it! …The International orders still have not shipped. The trucking company has kept delaying them. They were supposed to be delivered on the 5th, then the 12th, then the 13th, then the 14th, then the 15th, now they say the 16th. All the labels are printed up and ready to go. We just need the swords. Well, that eases my fears somewhat… the delay in Longclaw’s arrival was becoming a little worrying. Valyrian, did the swords arrive today? Hey Valyrian, I got my Longclaw yesterday (Canada). No troubles getting it through customs, only had to pay tax (which I expected). Looks great! Please continue using USPS (not FexEX or UPS) and I’ll continue to buy your stuff! I got my Longclaw a couple weeks ago and it looks awesome! Everything about it is perfect and just as I imagined after reading A Song of Ice and Fire. He’s hanging on my wall right now. I received mine as a Christmas present from my wife (God bless her!!!). I wasn’t thrilled about the packaging, but once I got it out and had a chance to look it over, I was impressed. The quality seems to be very good–I have other swords of various quality to compare it to, and I would put it up with the best of my others. The blade texture was a big surprise, for sure, as I expected it to be some sort of painted Damascus type pattern. Honestly, for a sword based off a fantasy piece, with all the detail and quality it has, I’m surprised at the relatively low cost! I have already worn the sword in a back scabbard I have to a Renn fest with a “Jon Snow” get up, and was pleasantly surprised to have been recognized as such. I cannot wait for Ice to come out and maybe Dawn(hint, hint, Valyrian Steel! ), as I look forward to future Christmases!